We talked to Alison Reeve, Director for Clean Energy Technology Innovation at the Australian Government Department of the Environment and Energy, about Australia’s role in Mission Innovation (MI). Alison highlighted how Mission Innovation has raised awareness of the role of R&D in achieving the Paris commitments. Australia is a participant in all seven Innovation Challenges (ICs). Its experts have participated in the MI deep dive workshops on Smart Grids (IC#1), Carbon Capture & Storage (IC#3) and Affordable Heating and Cooling of Buildings (IC#7). Participation has provided Australia with an opportunity to contribute to the definition of research priorities and has led to new relationships with international collaborators. 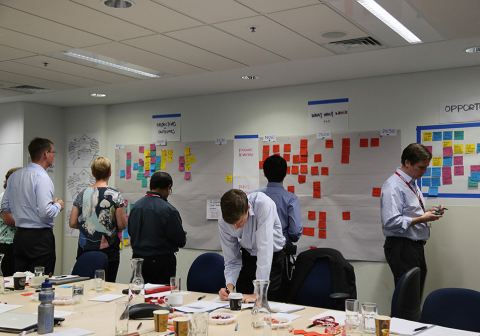 Australia’s Mission Innovation team in a planning workshop with industry and academic stakeholders. But Australia is going further. Moving beyond discussions about research priorities to building international collaborations is key to accelerating clean energy innovation and Australia is providing funding to make it a reality. The AUD$5 million International Engagement fund will support the participation of experts in the MI Innovation Challenges and the International Energy Agency’s Technology Collaboration Programs. The selected experts, to be announced in February 2018, will be funded to participate in MI Innovation Challenge activities and will be required to share the knowledge gained with the national research community, offering significant benefits to clean energy R&D in Australia. 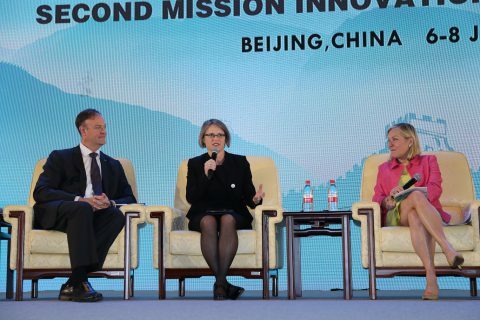 As well as encouraging collaboration between individual researchers, Australia is encouraging cooperation between research institutions at home and abroad. Leading Australian universities will collaborate with top German institutions to build economic and technological opportunities from the global transition to clean energy. The new Energy Transition Hub, expected to be worth more than AUD$20 million, was announced at the 2017 G20 meeting in Hamburg. Australia is also making steady progress towards the MI doubling target of AUD$216 million. For example, AUD$29 million has recently been allocated by the Australian Renewable Energy Agency (ARENA) to 20 research projects to propel the development of solar PV technology. The Hon. 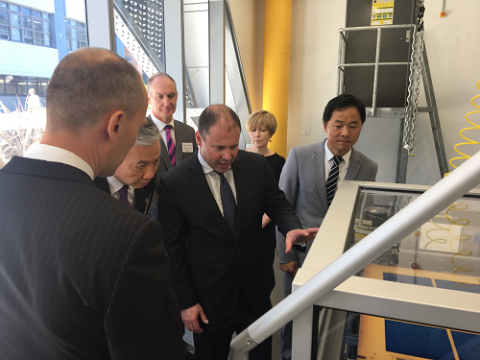 Josh Frydenberg MP, Minister for the Environment and Energy, on a visit to the University of New South Wales Solar Industrial Research Facility. In addition to public sector investment, Australia is also harnessing private sector financing for clean energy innovation. The Clean Energy Finance Corporation (CEFC) has access to AUD$10 billion to invest and is also tasked with leveraging funds from other private sector investors. The highly innovative Sundrop Farm project in South Australia is an example of where the CEFC’s efforts brought in sufficient private investment to make a project viable without government subsidies. The project uses solar thermal technology to provide irrigation from desalinated seawater and heating and cooling for greenhouses, harnessing the significant solar resource of South Australia. Making agriculture feasible on this marginal land is an example of the transformative potential of innovation in two sectors. The CEFC has also made transformative investments in a diverse range of projects, from seed capital funds to carbon fibre wheels and building upgrades. Every dollar of CEFC funding leverages more than two from the private sector as well as delivering a commercial return to the Australian Government. The world’s largest battery (100 MW) was switched on in South Australia in December 2017. The Hornsdale Power Reserve was only commissioned late in 2017 but is already playing a vital role in balancing the grid during the extreme heat of the Australian summer when reliability can be affected by the combination of high temperatures and increased demand. Clean energy innovation is also being seen at the consumer scale. Australia installed 1.1GW of rooftop solar in 2017, of which nearly three-quarters was on homes. Seventeen per cent of Australian households have solar power so there is a consumer driven demand for smart grid technologies. The Clean Energy Innovation Fund, managed by CEFC in partnership with ARENA, is a series-B investor in the decentralised energy exchange, which allows power-trading between neighbours, using blockchain to help households and business trade or share power with one another. Australia sees an opportunity for MI member collaboration to accelerate the development of hydrogen as an energy carrier. The recent significant fall in the cost of renewable energy improves the commercial viability of hydrogen production. 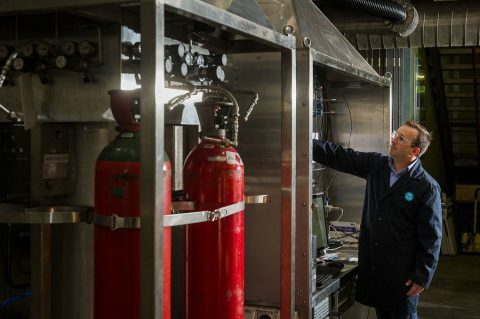 Consequently, the Commonwealth Scientific and Industrial Research Organisation (CSIRO) has set up a Future Science Platform on Hydrogen Energy Systems worth AUD$13 million. Future Science Platforms are multi-disciplinary collaborations to support innovation and create new industries. CSIRO has also developed a membrane to extract pure hydrogen from ammonia, making it possible to capture the huge renewable energy resources in Australia for distribution around the world. In conclusion, Alison encouraged MI members to focus on working together to achieve breakthroughs in clean energy innovation and to build on the momentum generated at workshops by defining priorities for future collaboration. If you are interested in exploring opportunities for collaboration on hydrogen research or would like more information on any of the other subjects please contact Alison Reeve.